From a four-chuck system to the true 3D cutting head, the 3D FABRI GEAR and FG-220 DDL transform operations one tap at a time. The 3D FABRI GEAR line was introduced in 1999 and since then Mazak has continued to advance their 3D laser-cutting technology. The FABRI GEAR III comes in two sizes the 220 and 400 both featuring a six-axis laser available as a 2.5kW or a 4kW. The length of the material is the same but the FABRI GEAR 400 processed rounds up to 16 in. where the 220 is 8.6 in round capabilities. 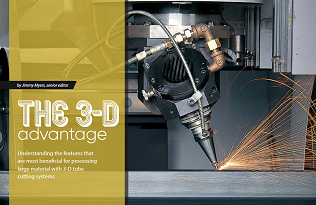 Mazak has engineered a proprietary 3D cutting head that maximizes flexibility and the range of movement which expands the range of applications possible. User defined cut angles are useful for weld prep and getting the highest accuracy for easy fit-up assemblies. While the FABRI GEAR isn’t the only tube laser on the market, its chucking systems’ engineering stands out. The FABRI GEAR’s four-chuck system allows full control of raw material and finished parts throughout the process. “Most tube lasers on the market only utilize a two-chuck stems. A four-chuck system is especially important when making long, large and heavy finished parts,” Explains Tyler Van Wyhe, Mazak applications engineer. The four-chuck design is ideal for processing structural materials such as I beam, H beam, angle iron, c channel, HSS, along with other user defined materials. Common with structural materials is inconsistent shapes like it being bowed, twisted or misshapen which makes the four-chuck system vital. 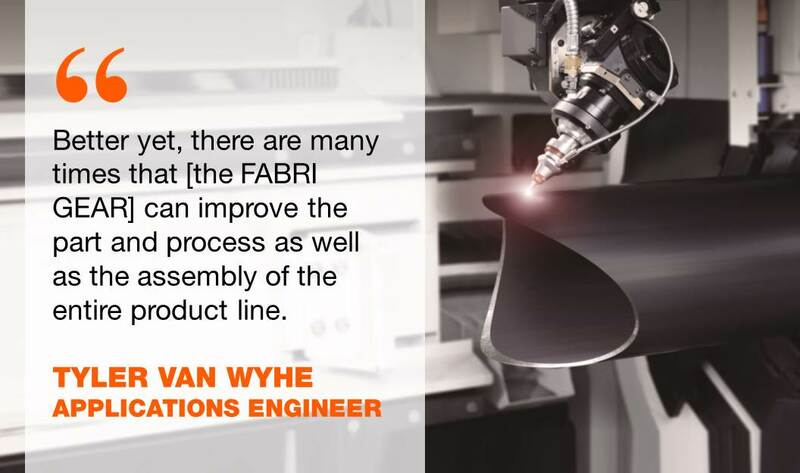 Van Wyhe says it is crucial to have the FABRI GEAR work and function as a full system. 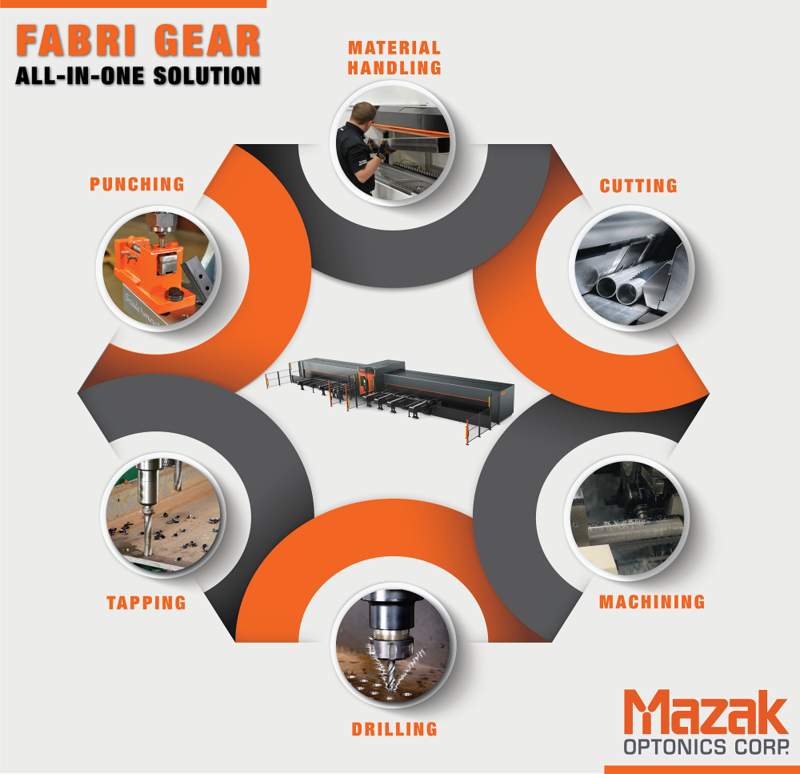 Mazak leverages automation to load, material, cut parts, tap, chamfer holes and unload finished parts all with little to no wait time from simultaneous operations. Thermo Energy also experienced this with the implementation of their FABRI GEAR. Dave Loewen of Thermo Energy stated, “The FABRI GEAR’s flexibility has allowed us to think of any design and we are able to create it." Loewen further explained, "Because the FABRI GEAR is so precise, we have less to worry about during the assembly and installation process". ThermoEnergy has been able to make their tube and pipe process a one man job, cutting the processing by two-thirds. The FABRI GEAR incredibly unique with built in tapping, up to 6 different taps, and the six-axis head allowing for 3D geometry from beveled and mitered end cuts to countersink holes. Other notable features include a measuring system that automatically measures material length through a sensor and another sensor in the cutting area that measures the material and compensates for distortions. Not only has Mazak been an innovator in 3D laser cutting but also in laser generators, direct-diode laser (DDL). 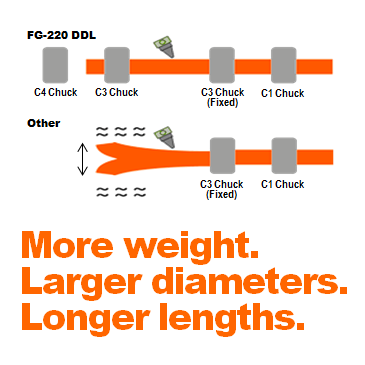 Mazak’s next generation of the FABRI GEAR machine now utilizes DDL technology in the FG-220 DDL. This laser source delivers high performance and reliability over CO2, fiber and other solid-state laser generation systems.